Over the last several years, we’ve been bombarded with mainstream stories about how interest rates have nowhere to go but up. Inflation, recovery, and most of all fundamentals. Who in their right mind is going to buy all this government debt! The supply is rising and, according to these people, the demand can only be falling. There is nothing in favor of lower interest rates. The expected result: epic BOND ROUT!!!! But it never materialized. Supply has increased, to be sure, but demand has more than kept up. Who keeps buying? Why? Government yields are falling all over the planet again. For the definitive answer, we need only ask Bill Dudley (of all people). Though he never really comprehended and interpreted what he was talking about, he at least summarized the object correctly. This was all the way back in March 2008, just days after Bear Stearns. How anyone viewed Bear’s ultimate disposition, as I noted earlier today, a rescue or a failure, seems to have informed their view over the many years since. Yep, that lesson remains the only one that has mattered. As a global bank, you saw rising global eurodollar illiquidity change Bear Stearns from a “viable firm” to JP Morgan’s reluctant target in a matter of days. You don’t need an LCR mandate to begin thinking about liquidity and only liquidity. 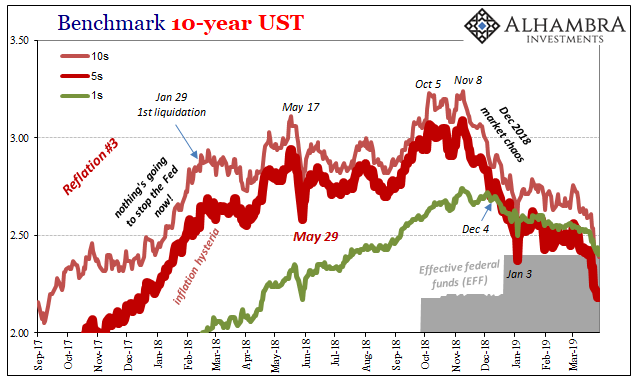 Thus, whenever the slightest little hint of the same things shows up in some serious fashion, global banks easily fall back on the most liquid assets the world has to offer: UST’s, bunds, JGB’s, whatever. May 29. Yield doesn’t matter; survival is all that counts. It is absolutely true what the detractors say about especially the US government’s debt. The fiscal situation is a nightmare and not likely to change anytime soon. There doesn’t appear to be the usual grow-your-way-out-of-it option available, either, like there was in the fifties “paying off” the debt incurred during WWII. But as much as those are legitimate fears, they are nothing compared to liquidity risks. Prospective default or a jubilee in UST’s is something to worry about years down the road. The phone call from BONY demanding collateral or reversal of funding can happen tomorrow particularly when global eurodollar markets are such a mess (see note below). Thus, Euro$ #4 was only ever going to lead to lower bond yields. And no matter what they said in 2017, it was only ever going to lead to Euro$ #4. That doesn’t mean the 10s or 30s won’t move. They do, and did. What it really means is that there isn’t a meaningful difference where the yield curve flattens at 2.50%, 2.62%, or perhaps even as much as 3.00% on the 10s. At some point, unless something in the monetary system really does change, Jerome Powell (I’m assuming) is going to find himself with dots well above the long end. In other words, inversion was almost inevitable, an unavoidable collision in views. The dots never really got that much higher simply because Euro$ #4 roared into both market and economic view much faster than policymakers grew confident. 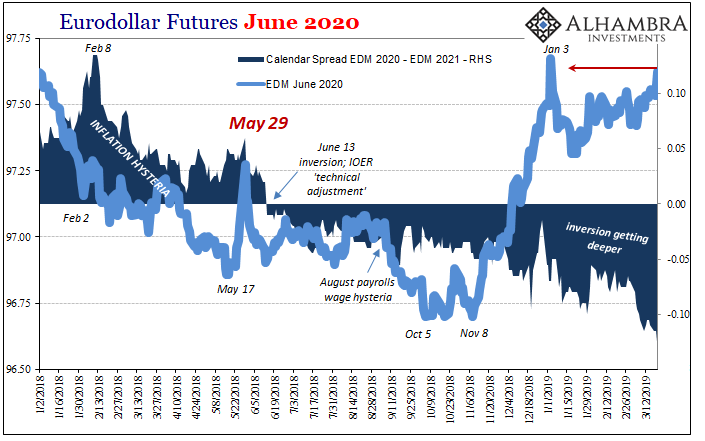 It came on so hard at the end of 2018, things changed in a matter of weeks (the FOMC’s epic flip flop at the end of last year). The Fed is now encountering long end resistance in its “rate hikes” far, far less in nominal terms than it did ten years before. They are pushing up short rates into what’s really a much lower ceiling. This is profound, and a challenge FOMC officials are well-aware could derail their efforts (though they have had to come up with increasingly convoluted and often ridiculous reasons for it). 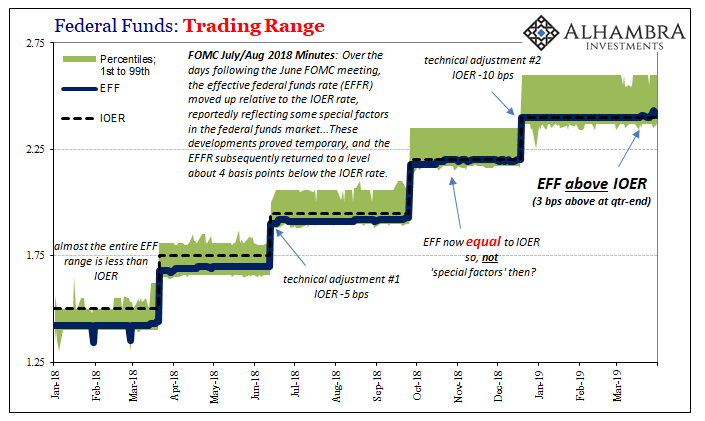 The long end is once more confronting the Fed’s assumptions behinds its “rate hikes” this time at less than 3%, which translates into an economic growth paradigm unchanged from 2008 when all that emergency monetary experimentation really began. The bond market’s message is consistent top to bottom. Liquidity risk rules which keeps the curve low, the banking system always ready to buy. These liquidity preferences are what harms the real economy, justifying the low bond yields. It seems like a chicken and egg problem except that if you solve liquidity risk the whole thing goes away. The only good thing about the QE’s was how they definitively proved the central bank, any of them, isn’t going to solve the problem. It would be better if more people understood this, and bonds, but that’s one reason why this all seems to be a paradox. It is April 2019 and Bear Stearns still looms over everything. Who is going to buy all that UST debt? Everyone who was really paying attention in March 2008. And they are going to keep on buying until there is no next Euro$ #. NOTE: How much of a mess are US$ money markets? I could cite repo especially at the end of last year or quarter, but how about just EFF. Effective federal funds has been especially unruly in the last few weeks breaking above IOER (the joke). 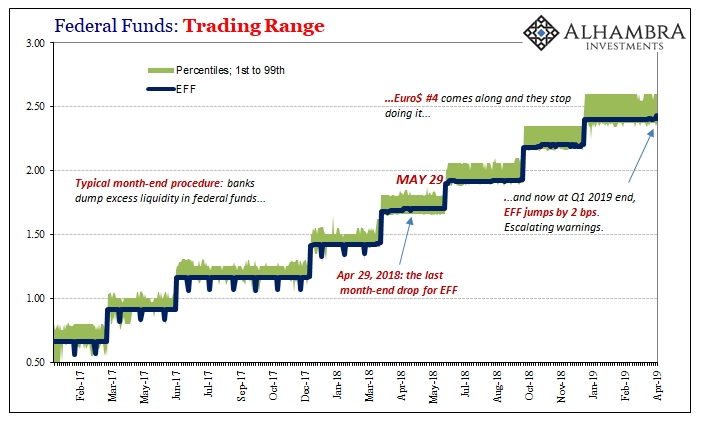 However, EFF at the end of Q1 2019 displayed a new level of dysfunction, an important change that perhaps tells us something more about how Euro$ #4 is still progressing. It had been typical before this latest squeeze erupted for EFF to fall at each window dressing opportunity. At the end of each month, banks would dump spare liquidity onto the federal funds market so that for one day the effective rate would drop a few bps out of line from where it had been consistently placed during each one. At the end of Q1 2019, however, EFF went the opposite way. Already 1 bp above IOER beforehand, on March 29, the last trading day, it came in at 2.43%, or a total of 2 bps further above IOER. If they aren’t dumping spare liquidity here, maybe there is no longer any to spare? So, not only did EFF move further away from the “ceiling” it also moved in the wrong direction from what had been the established quarter-end pattern. Escalating warnings. We have to ask, why? Federal funds is an irrelevant market. As I’ve written since last year when all this misbehavior started, we pay attention to EFF’s impishness because it tells us something significant about the rest of the money markets that do matter. It must be serious if what’s going on out there in them causes reverberations that shake up everything up to and including what’s otherwise irrelevant. It is not anywhere close to the same degree as what was happening in March 2008, but it is of the same type. Like frightened deer, banks bolt out of the clearing and back into the safety of the woods at the first sound they hear. There’s your demand for UST’s and the like.